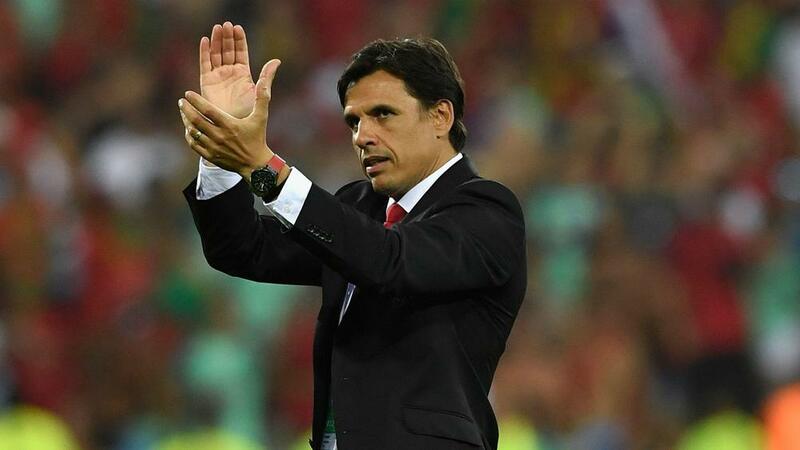 Chris Coleman has called on Wales to build on their Euro 2016 heroics by qualifying convincingly for the World Cup. Wales reached the semi-finals in their European Championship debut and first appearance at a major tournament since 1958. The coach is now adamant that his team must book a place at the event in Russia in 2018 as they bid to become regulars on the big stage. "We talked about not just doing it once but making sure we're there or thereabouts every time... rather than doing it once every 50-odd years," he told a farewell news conference following their 2-0 loss to Portugal on Wednesday. "We've got to be realistic in our thinking and our demands. But we've also got the possibility to build on this and not let it be a one-off. That's going to be hard work, of course. "We've got to make sure we don't fall into that comfort zone. We're on dangerous ground. It's about what we do next. We've got to go and qualify for the World Cup. And that's progression from us. "There's a different type of pressure on us. People won't be happy with plucky Wales - they'll expect us to deliver." Coleman was quick to reject calls for Wales to return to the national stadium after their successful qualification efforts at the smaller home of Championship club Cardiff City. "Cardiff City Stadium is our home," he said. "We get 30,000 sell-outs, the atmosphere is electric. It's where, in the last campaign, the feeling that was generated by our supporters had a huge impact on the team. We shouldn't forget that. "We could gamble and go back to the Millennium Stadium and it's an amazing stadium, we know that. And we could maybe get another 20,000 supporters in there. But we made a choice. We said 'Cardiff City Stadium is our home for the next campaign'. I imagine we'll stick with to it. "We should remember what served us well and not mess about with the ingredients." And the coach is also hopeful his older players remain available for the road to Russia, starting at home to Moldova on September 5, followed by games against Austria, Georgia, Serbia and Republic of Ireland, home and away. "We're going to need everybody again," he said. "I hope this isn't the time when any of them are thinking, 'we're going to go out on a high'. "You can forgive them for doing that but I hope they don't. "My advice to them is to enjoy while they still can. Because when you stop you'll always miss it. Your playing days are your best days."